Chris, let me first say, in this response, that I absolutely thought and therefore felt the same way that you do now, when I had BPD. Because I have recovered from BPD I know that recovery from BPD is possible. © The BPD Coach A.J. Mahari and Touchstone Life Coaching August 28, 2009 - All rights reserved. If you would like to ask the BPD Coach, A.J. Mahari, a question, please email her at bpdcoachaj@yahoo.ca with your question. Please also indicate if you would be okay with your name being used if A.J. responds to your question here. If not, please suggest a pseudonym that you would like your question attributed to. Please Note: Sending a question to "Ask The BPD Coach", A.J. Mahari, at the above email does not in any way constitute hiring A.J. as your coach. 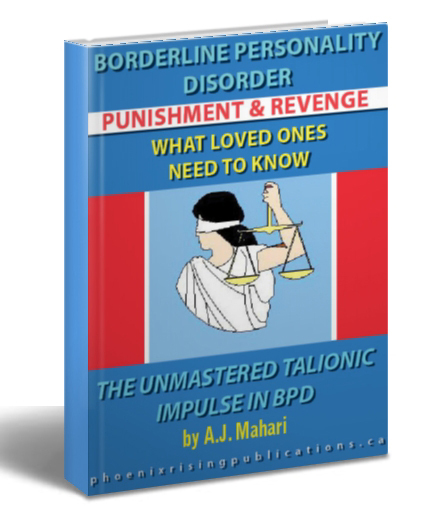 To purchase life coaching or BPD coaching sessions please visit Touchsonte Life Coaching or go directly to Phoenix Rising Publications to purchase life or BPD Coaching with A.J. Mahari. All responses given by The BPD Coach, A.J. Mahari, are meant to convey general information and are not intended to be in anyway a specific recommendation or commentary on any personal life situation. Coaching is not therapy. It is also not a replacement for professional therapy. Coaching can be an effective adjunct to professional therapy for those with Borderline Personality Disorder and/or their loved ones. A.J. Mahari is Asked About Her Recovery From Borderline Personality - Can you Recover? How Long Does it Take? Why Does Borderline Personality Hurt Me So Much - I can't stand the pain what do I do? Does My Borderline Wife Really Love Me? Can I Recover From Borderline Personality Disorder?